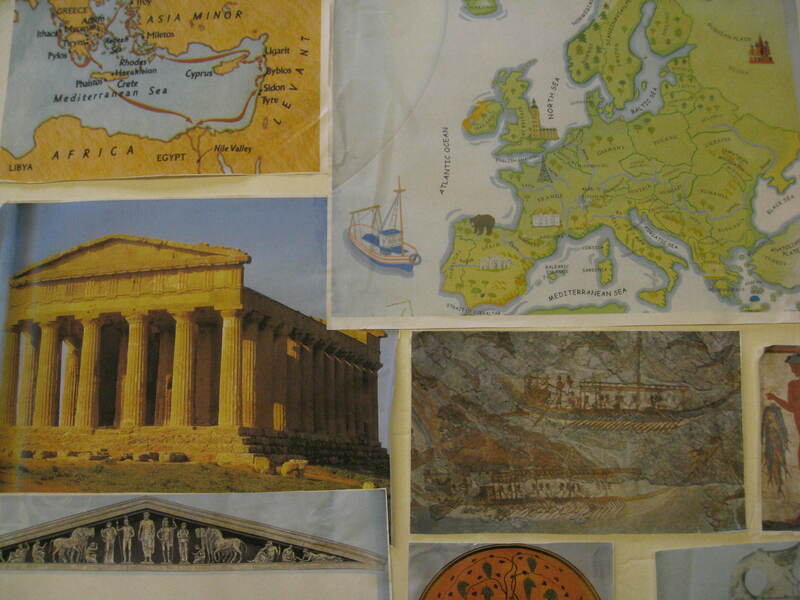 Most of the prints in this packet are of ancient Minoan artifacts found on the Greek Island of Crete. 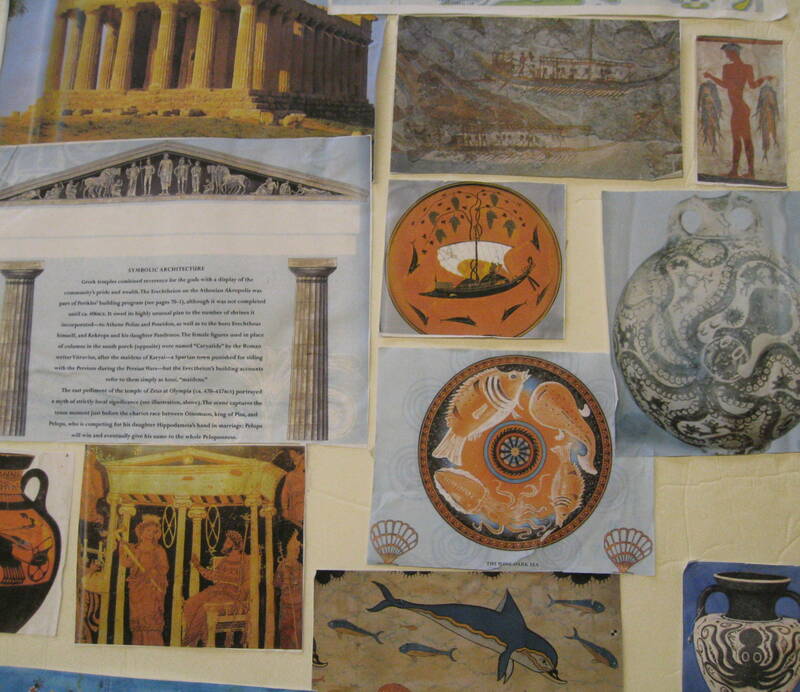 Also, two Modern Art collages are included because their subjects are based on an Ancient Greek legend having to do with King Minos, the Cretan leader this ancient culture is named after, and because the myth took place on Crete. The Packet lends itself well to many types of art projects, including coil pottery, full round or relief clay sculpture, repoussé metal sculpture, plaster fresco painting, even modern paper collage. No other Art Discovery Packet contains so many varied examples of two-dimensional and three-dimensional art. Although there are only eight prints, this Packet contains so much information that it lends itself extremely well to at least two completely different presentations and projects, if the teacher is agreeable and you have the time or the interest. How an artist creates the feeling of MOVEMENT is an important topic of discussion for Grades 3–5. 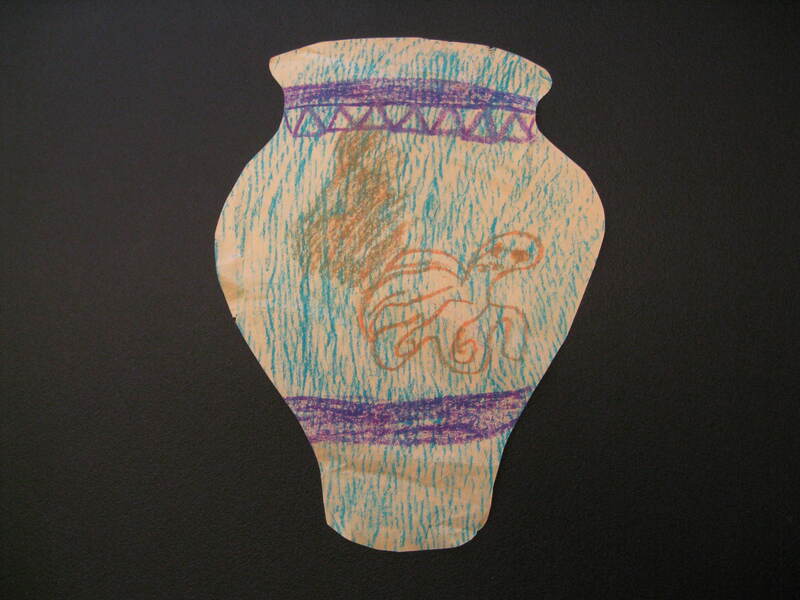 Bull Leaping Fresco, Ivory Figure of an Acrobat, Pair of Gold Repoussé Cups, and Octopus Pitcher are such great examples of movement that Kindergarten-Second Graders can even be introduced to discussion of this important and Basic Art Principle (refer to Basic EALRs list). Discussion on Artistic Style might include REALISIM versus EXPRESSIONISM when presenting the abstract cut paper collage of Icarus. This work is an example of Abstract Expressionism. The appearance of the Icarus portrait is distorted and simplified, instead of realistic, like a photograph. In this style of presentation, the artist wanted to express a MOOD. He was not worried about a realistic look, only communicating a feeling to help tell the tragic story. Define and discuss the term ABSTRACT. Carved Bull’s Head Rhyton has an excellent discussion on creating TEXTURE with LINE. This is now a vitally important topic for Grades 3-5, in preparation for the new State WASL Classroom Assessments. Challenge pages are optional for 4th or 5th grade. Consider handing out a challenge topic that time will not allow you to cover, but make sure kids at least SEE the topic artwork. Challenge page helps kids retain information from the Presentation. Reward those who accept and follow through with your challenge. Ask teacher to pass out Research Challenge at least a week before your visit. It can encourage interest in your upcoming visit. Off the coast of Greece, in the Mediterranean Sea, halfway between the continents of Europe and Africa, lies the island of Crete. For at least three thousand years, people told incredible and adventurous stories about this island. From many of these stories, we know that the island had once been home to an impressive, highly intelligent, and artistic civilization, known today as Minoan, after its most famous leader, King Minos. One ancient Greek historian wrote this about King Minos, “He controlled the greater part of what is now called the Hellenic (Greek) Sea; he ruled over the Cyclades (Aegean Islands), in most of which he founded the first colonies, [and was] the first person to organize a navy.” Later scholars dismissed King Minos and his people as only make believe characters of adventurous Greek legends. However, discoveries made in 1900 have turned up evidence suggesting that many of the early myths concerning Crete may have been based on truth. Excavations on Crete now prove that the Minoans established one of Europe’s first great civilizations and constructed magnificent cities and impressive palaces. These people farmed the land and dominated the sea around their island. They built large fleets of ships and traded goods throughout the Mediterranean area, as well as in Egypt. In 1894, a British archaeologist named Arthur Evans began excavating at Knossos, on the island of Crete. Evans was a wealthy British scholar who was forced by poor health to spend much of his time in the warm climate of the Mediterranean. One day, as he was poking around in an antique shop in Athens, the owner showed Evans some small engraved stones that had been found on Crete. The stones were covered with strange, squiggly markings. Evans thought the markings might be some form of ancient writing. He wondered if he might find more stones and if he could decipher their markings. Evans bought some land in the small city of Knossos where many ancient artifacts had already been discovered and what he found there was so much more than he had bargained for! Evans discovered huge walls and staircases that were part of an elaborate and massive palace, measuring 215,000 square feet, or six square acres. He believed that the building might be the legendary palace of King Minos. After excavating the palace, Evans carefully rebuilt it. As he unearthed the artifacts from this site, Evans was convinced that the palace had been continuously occupied for thousands of years, by a very advanced civilization. When he found no evidence or record of what these people had called themselves, Evans named them “Minoans”, in honor of King Minos from early Greek mythology. Although the Greek and Minoan civilizations were separate, references to Crete, to events that happened there, and to various Minoan kings often appear in Greek myths. Evans believed that these myths were truly based on this lost and very real civilization. He spent more than thirty years and over $2 million dollars investigating this site—an extremely large amount of money in the early 1900’s. Evans was amazed to discover that the ancient palace was equipped with an incredibly modern plumbing system. A system of jointed clay pipes linked the palace with a mountain stream six miles away. Each pipe segment was tapered at one end so that it would fit into the next pipe. Stone bridges lifted this pipeline over ravines so that the water could flow at a steady, slightly downward angle toward the palace. Running water was carried this way to tubs, sinks, and even flush toilets in elegant palace bathrooms! The heavy rainfall on Crete during the colder months required a system of adequate drainage for the roofs of the palace. The Minoan architects built an intricate system of ducts, gutters and basins on the outside walls that would funnel the run-off. Some of this water was stored in tanks for drinking or else diverted into the plumbing system. Although no evidence of a labyrinth (or maze) was found at Knossos, it is believed that the enormous amount of intricate and confusing passageways throughout the palace may have given Greek visitors a false impression of an intentionally designed maze. Scholars have suggested that the misunderstanding may also have been the result of a difference in word meaning. Because the double ax was an important religious symbol to the Minoans, they referred to their palace as “a house of the double ax”, or labyrinthos. To the Greeks, this same word meant “a large building with intricate and confusing passageways” or, in other words, a maze. The beginnings of life on Crete are still a little bit of a mystery. If Greek myths can be believed, Crete’s history goes all the way back to the birth of Zeus, ruler of the Greek gods, who was supposed to have been born in one of the island’s caves. Archaeologists believe that civilization began on Crete around 6000 BC, according to artifacts found there, when primitive farmers first settled on the island’s north shore and built mud-brick huts. These original residents also grazed cattle, sheep and goats. No one is sure where these early farmers originated. It was first thought they were early Greeks. However, the Minoan civilization has been discovered to be much older than the Greek one. Differences in Greek and Minoan languages and customs also prove that one of these civilizations is not simply an offshoot of the other. An example of this difference is the fact that early Greeks wore and admired beards but not one Minoan artifact depicts a Minoan man with a beard—they were all clean-shaven. In about 3000 BC, more of these original settlers sailed to Crete. The small, dark-haired, dark-eyed settlers evolved into a very advanced civilization on Crete. These people knew how to pound and shape metal (bronze, copper, silver and gold) into tools and ornaments. They were thought to have been descendants of a civilization that had evolved in the Middle East and had gradually spread westward across Asia and parts of Europe. The first settlers had come to Crete by boat and used these boats to trade their surplus grain, olives, olive oil, timber, wine, jewelry, pottery, and bronze tools for the luxuries of other lands. As the Minoan trading empire increased in size, more ships were needed to transport cargo, so they built an impressive fleet of sailing ships. Because pirates constantly attacked cargo ships, Crete’s kings put professional soldiers on each Cretan ship to protect the crew and cargo. This proved a successful answer to the problems of piracy and the Minoans became the undisputed rulers of the Aegean seas for centuries. What happened to the ancient Minoan civilization of Crete? As the palace at Knossos was excavated, archeologists discovered evidence leading them to believe that some kind of great disaster had occurred on Crete around 1400 BC. 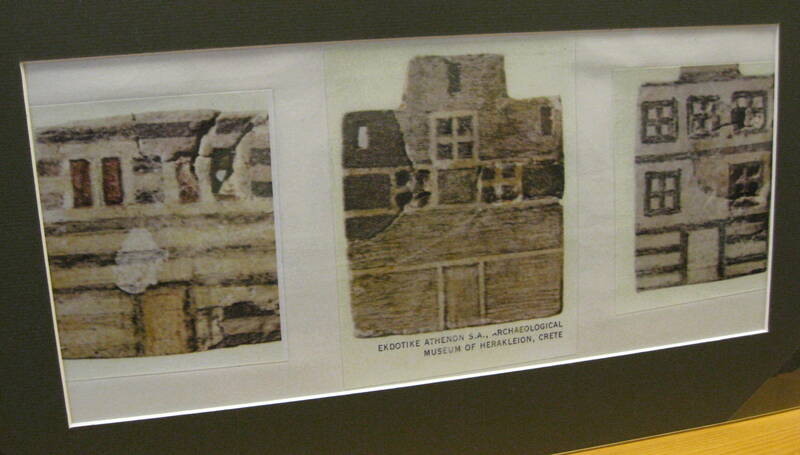 Smoke stains found on the palace walls of Knossos point toward the fact of a large fire there. Scattered ritual items found in some rooms gave archaeologists clues that people had left the palace in a big hurry. A possible explanation could have been that they were escaping a rapidly moving fire inside the palace. Another possibility might have been that a severe earthquake (earthquakes were common on Crete) caused walls to crumble as people quickly escaped. Archaeologists have uncovered many clues but they still do not know for sure what may have happened to this ancient culture. The one thing Archaeologists do know for sure is that after more than six hundred years of an advanced Minoan civilization—marked by peace, prosperity, freedom and stability—something caused an enormous change on the island. Evidence found at Knossos shows that, from around 1450 BC, the population of Crete was no longer purely Minoan. Another group of people, called the Mycenaeans, had occupied Crete. The Mycenaeans were a powerful culture from the Greek mainland that introduced horses to the Mediterranean area. These people were blonde, sharply contrasting the appearance of the dark haired Minoans. Although scholars are not sure exactly how much the Mycenaeans influenced and controlled Minoan life, evidence suggests that these two cultures coexisted under an arrangement that left the newcomers in charge. However, even under this new situation, palace life at Knossos stayed luxuriously similar with only a few important changes. One significant difference was that, for the first time, horses and chariots were listed in records of the palace inventories. Other evidence proved that the Mycenaeans were very interested in military issues and weapons, uniquely unlike the peaceful Minoans who had never felt a need to even build fortified walls along their island’s shores. The cooperative coexistence of original Minoans and newer Mycenaeans lasted for about fifty years, until all indication of the Minoan civilization suddenly disappeared. Some scholars have suggested that a volcanic eruption and major earthquake ended the Minoan civilization, around 1400 BC. Earthquakes are still common in that part of the world. Archaeological evidence indicates that the Minoans had repaired and rebuilt palaces and cities, which had been damaged or destroyed by earthquakes, many times throughout their long history. This fact leads other scholars to doubt that even a massive earthquake could have been the final cause of the Minoan civilization’s end. Another theory is that a different group of Greeks from the mainland attacked the Mycenaean Greeks, in an attempt to take control of the island, and a majority of Minoans may have died in a devastating conflict. The smaller remaining band of Minoans may have simply melted into the larger Mycenaean group. Archeological clues found on Crete have helped piece together a long and interesting history of the ancient Minoan civilization, but exactly what eventually happened to these people remains an unsolved mystery. Crete is an island made mostly of limestone. Limestone is a sedimentary rock, soft enough for seawater to carve and hollow out caves and intricate passageways as waves have pounded against this island over thousands of years. The people of Crete once believed these caves were sacred and used them as places for religious offerings and ceremonies. 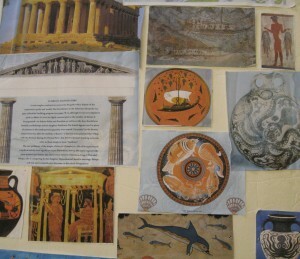 The Greeks and Minoans shared many myths. One important myth tells about the birth of the Ruler of the Greek Gods, Zeus, who was born in one of Crete’s limestone caves. According to Greek mythology, in the beginning of time there was no life or nature in the universe. There was no sky, sun, moon or stars; there was no water, no lakes or oceans, not even air to breathe. From the mists and formless upheaval and chaos of the universe, the supreme powers of the sky, Father Heaven, or Uranus, and Mother Earth, or Gaea (JEE uh), arose and became parents of the Titans, the first race of mythological giants known as “the Noble Ones”. Uranus and Gaea had twelve children—six sons and six daughters. Six of these children and their descendants, the Olympians, became the gods and goddesses of ancient Greek mythology. Uranus liked peace and heavenly quiet. Some say that he wanted to keep this peaceful and calm Golden Age undisturbed by the disruption of children. Others say Uranus was afraid and jealous of his children. Either way, he was a brutal and demanding husband and father who cruelly imprisoned his children in a horrible place beneath the earth, as soon as each of them were born. Finally, Gaea could bear her husband’s cruelty no longer and helped her youngest and cleverest son, Cronus, overthrow his father and become the new ruler of the universe. Cronus then married his sister, Rhea, but their happiness was soon upset by an ominous prediction of their mother, Gaea, who foretold that one of Cronus’s children would overthrow him exactly as he had overthrown his own father, Uranus. To protect himself from this fearsome prophecy, Cronus swallowed his first five children—Hestia, Demeter, Hera, Hades, and Poseidon—immediately, as each of them were born. Rhea still loved her husband but she could not let him destroy any more of her children. When Rhea was about to give birth to her sixth child, she decided this one would not suffer the same fate of her first five. While Cronus was busy, Rhea slipped away to a remote island cave, on the island of Crete, where she gave birth to a baby boy; she named this child Zeus. Keeping the baby carefully hidden and protected on earth, Rhea returned to Cronus and told him of the birth. She then tricked Cronus into swallowing a rock, believing it was the newborn infant son. As the years went by, Zeus grew into a strong and handsome young man. When he was old enough, Rhea brought Zeus to the palace where he became “cup bearer” for his unsuspecting father. For this job, Zeus had to fill, carry, and protect the cup from which his father drank. One evening, Rhea mixed a powerful potion for Cronus, poured it into a cup, and persuaded Zeus to serve it to his father. Cronus, thinking the harmful mixture was wine, drank the potion, became sick to his stomach, and threw up his first five children, now grown adults. Zeus and two of his brothers waged a mighty war against Cronus and the other Titans, for control of the universe. When Zeus and these brothers were finally victorious, they imprisoned Cronus and his group inside the earth, where their continuing struggle to free themselves still causes gentle rumblings and sometimes, violent earthquakes. Next, Zeus and his two brothers divided the rule of the universe between themselves. Hades was given the lower world and became the giver of all wealth and ruler over the minerals and treasures within the earth. Zeus was given the heavens. Poseidon was given the earth, both its land and its seas. Their sister, Hestia, the first-born of Rhea, became the goddess of home and of the fire burning on the hearth. The next sister, Demeter, became goddess of the fruits of the earth and of the harvest. Hera became goddess of womanhood and marriage and, as the wife of Zeus, Queen of the gods. Together, these six deities went to live on Mount Olympus, the highest peak in Greece, from where they ruled the universe. According to Greek legend, a king named Minos once ruled the island of Crete. This king was a son of Zeus, the greatest of all the gods of Greek mythology. Powerful King Minos controlled the seas and colonized the neighboring islands. King Minos had a wife named Pasiphae (pass if ay). To show his love for his queen, Minos used some of his wealth to build a palace for her at Knossos. Minos planned a magnificent structure. No detail was overlooked and no expense was spared. When the palace was finished, it had many rooms, beautifully painted fresco walls, winding staircases and running water. There were even bathrooms with bathtubs. The plumbing system of ancient Crete was never equaled until modern days. Because Crete was an island in the middle of the ocean, King Minos was always careful to honor Poseidon, the god of the sea, with regular sacrifices. According to legend, Poseidon would keep the seas around Crete calm, as long as these sacrifices showed him proper respect. Minos usually sacrificed one of the healthiest bulls from his flock. Once, when Poseidon demanded a certain white bull, which Minos prized very highly, the king selfishly refused the god’s request. Legend says that this made Poseidon angry and he caused gigantic waves to dangerously crash against the small island. Eventually, Poseidon got revenge against Minos for his act of disrespect. When King Minos’ wife, Pasiphae, was waiting to have a child, the king prayed to have a son. 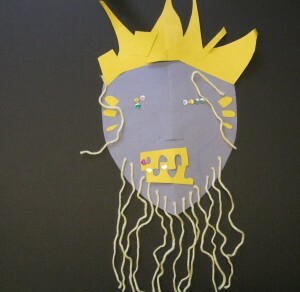 Poseidon caused the queen to bear a hideous monster. 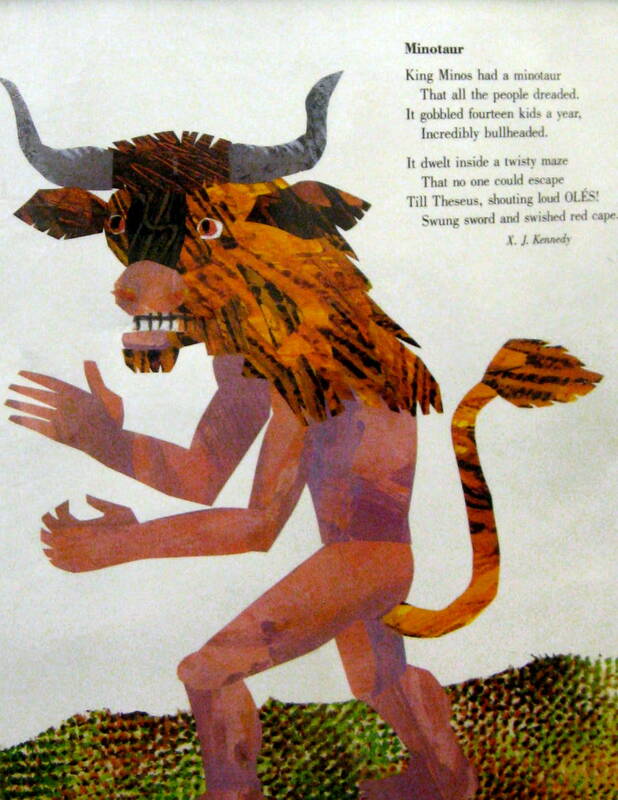 This monster, called the Minotaur (MIN uh tawr) because it belonged to Minos, had the head of a bull and the body of a man. In shame and fear, King Minos had Daedalus, his clever architect, build an intricate maze of walled pathways beneath his palace, to house the dangerous flesh eating beast. Daedalus was a remarkable architect and inventor who loved complicated mechanical things and thought about every problem as a challenging puzzle that could be solved, no matter how impossible it seemed. Daedalus was known everywhere for his creative and fascinating mind. The maze he created was called a Labyrinth and it was a marvel of confusion. One path led into another and another and another—with dead ends, false exits and endless turns. Once inside this Labyrinth, there was no way out! Minos was a ruthless and cruel ruler who had little respect for human life. Once, after he had defeated Athens in a war, Minos demanded as punishment that the Athenians send an annual delivery of six teen boys and six teen girls to Crete, as a tribute to him. Minos then sacrificed these young people to feed his fierce Minotaur. The young people were forced to walk into the Labyrinth and were never seen again. Things changed when a young Athenian named Theseus was sent into the labyrinth and escaped with the help of Daedalus. The princess of Knossos, Ariadne, fell in love with this handsome young man. She asked Daedalus to help her save Theseus. Ariadne gave Theseus a sword and a ball of twine, with instructions to unwind the yarn on his way into the Labyrinth so that he could find his way out after slaying the Minotaur with the sword. Theseus followed Ariadne’s advice, eliminated the ferocious Minotaur and easily escaped. King Minos was furious when he lost his prisoner, so Minos imprisoned Daedalus, with his son Icarus, inside the maze. Minos was sure Daedalus could not escape and both would soon be dead. The imaginative mind of the inventor was always active and Daedalus soon created a great escape plan. With his son’s help, Daedalus cleverly created two sets of wings from wax and feathers. He carefully attached these amazing wings across the backs and arms of Icarus and himself; the two would fly their way to freedom! Daedalus was confident his son would obey him. The two flew skyward, high into the clouds, away from the Labyrinth that had imprisoned them. The sensation of flight thrilled young Icarus. He flew and coasted through the air, just like a bird, but soon foolishly became too confident. Icarus forgot his father’s warnings and soared towards the sun, as if he had been born a bird. Suddenly, the wings of Icarus warmed and the feathers dropped from his arms. He cried out to his father, who could do nothing but watch as Icarus dropped into the sea, disappeared beneath the waves, and drowned. Since the beginning of recorded history, humans have wished to fly like birds. Leonardo da Vinci, during the sixteenth century, sketched a man in a flying machine with a parachute. Many scientists through the ages tried to discover the secret of flight. Imagining flight is, and has always been, a common human activity. The ability to fly is a frequent subject of many nighttime dreams. Did you ever have a dream where you were able to fly? Inventors are problem solvers and thinkers, skills that can be learned. Daedalus looked at problems as if they were fun puzzles to solve. When Daedalus was once approached with the problem of how to pull a thread through the complicated windings of a conch shell, he tied a silken thread to an ant. The ant was placed at the opening of the shell, then Daedalus put a few drops of very aromatic honey at the other end. Daedalus knew that ants love honey and have a keen sense of smell. The ant smelled the honey, crawled diligently round and round, through the intricacies of the shell, pulling the thread behind him as he headed towards the honey smell. Eventually, the ant came out the other end and had threaded the shell from start to finish. Collect a number of objects such as wire, twist ties, toothpicks, hair clips, buttons, old zippers, nails, screws, washers, bolts, scraps of wood, string, Styrofoam, broken toys, plastic spoons or forks, two liter pop bottles, bottle caps, jigsaw puzzle pieces, paperclips, rubber bands, toilet tissue tubes, aluminum cans, juice or shoe boxes, plastic bubble wrap, etc. Pretend you are an inventor like Daedalus and use these objects to create an interesting sculpture that looks like a new invention. Write a short paragraph describing what your invention is, how it works, and what it can do. An option would be to paint the entire “invention” sculpture a single (monochromatic) color, using tempera paint and big brushes. Use tag board to construct a new type of three-dimensional flying invention, then write a short paragraph (as described above) about your invention. Sketch and color an illustration of a zany new type of flying machine you just invented. 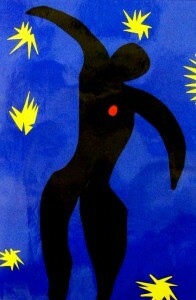 1.”The Fall of Icarus” by Henri Matisse (1943). Henri Matisse was born in France on December 31, 1869. He began painting while recovering from appendicitis when he was 20 years old. In 1891, Matisse moved to Paris to become an artist. In 1905, Matisse’s works were exhibited at the Salon d’Automne, along with the works of some other artists. One Paris art critic, Louis Vauxcelles, called their group “les fauves” (the wild beasts) because of their wild use of bright color to arouse emotions and create an exciting mood in their art. Although the title was meant as an insult, the group coined their new movement “Fauvism” and Matisse was their most famous representative. Matisse was the kind of artist who believed you should look closely at all of the beautiful things of the world. Bright colored tropical birds were some of the natural things he loved to observe. Matisse kept some tropical birds as pets and let them fly free around the rooms of his house so that he could closely watch and observe them. Whenever he drove in his car, Matisse took up the entire road and drove very slowly. He did this to “savor a sense of the trees”, in other words, to observe the beauty of the world around him, although it may not have been extremely safe. This is a modern, abstract picture, created entirely of cutout SHAPES with few details. Is this work of art an example or REALISM or EXPRESSIONISM? Expressionism, the artist did not try to make it resemble a photograph because it was more important to him to create a feeling or a mood. Does the shape of Icarus need to have more details? No, it is an abstract, Expressionistic shape representing the character from the Greek myth. The unusual, simple and modern shape may help viewers think more deeply about the story of Icarus and the lesson it teaches. What lesson does the story of Icarus teach? Possible answers may include obedience to the wisdom and experience of parents, kids being careful or responsible in dangerous situations. 2. “Minotaur” by Illustrator Eric Carle. That all the people dreaded. Till Theseus, shouting loud OLÉS! According to Greek Mythology, the Minotaur—a half bull, half man beast—was imprisoned in a Cretan Labyrinth (maze) built by Daedalus, the architect. Minos, king of Crete, demanded a yearly tribute of young men and women from Athens to feed this monster. 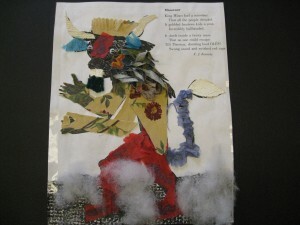 The Minotaur was finally slain in the Labyrinth by the Athenian hero, Theseus. Eric Carle authored his first picture book, 1,2,3 to the Zoo, in 1968, after a career as a graphic designer and art director. Since then, Carle has written and illustrated over three dozen books for young readers, including the modern classic, The Very Hungry Caterpillar, which has sold over seven million copies worldwide, in eighteen languages. Eric Carle has two grown children, and lives with his wife, Barbara, in Massachusetts. Dragons Dragons (published in 1991) is his second anthology of poetry; its companion volume, Animals Animals, made its debut in 1989. The artist prepares his own colored tissue papers. Different textures are achieved by using various brushes to splash, spatter, and finger-paint acrylic paints onto thin tissue papers. These colored tissue papers then become his palette. They are cut or torn into shapes as needed and are glued onto white illustration board to create collages. 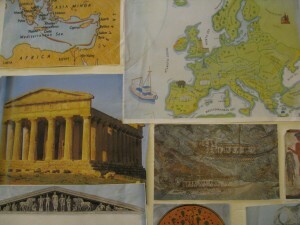 Some areas of his designs, however, are painted directly on the board before the bits of tissue paper are applied to make the collage illustration. What type of TEXTURE can you see in this picture? How would you describe it? The head and tail of the Minotaur appears to have long, shaggy fur. His body appears smooth because there is no fur or hair. How was this texture created? 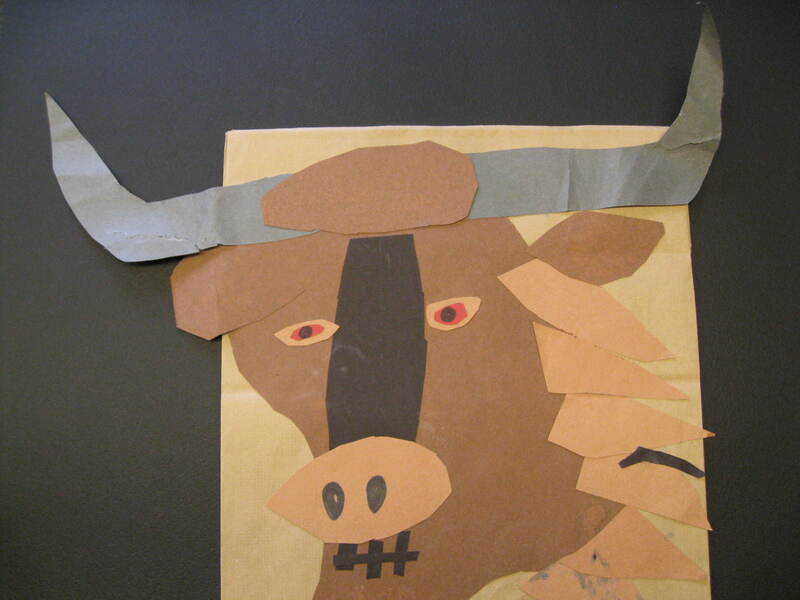 The fur of the bull’s head was created with broken LINES painted with dark brown and gold on tissue paper. Fur texture above the nose and between the eyes was created using curved and straight LINE, painted with black finger-paint on tissue paper. Painting on a block of carpet scrap, then printing with it, created the ground texture along the foreground (bottom). This was done before the Minotaur was glued to the background. How would you describe the TEXTURE of the painted foreground? Some descriptive words might include rough, bumpy, rocky, etc. Encourage EVERY age to examine and give a name to this created texture. Is this picture a Landscape, Still Life or Portrait? Portrait—person or animal is the subject. Be sure kids understand what a Landscape (outdoor scene) picture is and a Still Life (inanimate objects arranged on a table, such as flowers, books, or fruit) is also! Create your own style of fierce Minotaur sculpture with clay. Use a toothpick to create line texture. Use tempera, finger-paint, or watercolor paint to create a large and frightening picture of a Minotaur. Draw or paint a portrait of King Minos. 3. 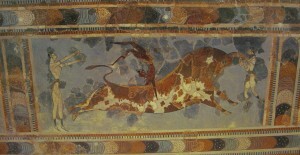 “Bull Leaping Fresco.” The Palace of Knossos, Crete. Circa 1500 BC. A fresco is a wall mural painted on wet plaster. Sections of the wall are covered with smooth plaster and, while the plaster was still moist, an artist applied paint to create a picture. By painting the plaster before it was completely dry, the colors were absorbed into the wall and remained vivid. The Minoans began decorating the walls and ceilings of their important buildings as long ago as 2000 BC. Painting directly on the wet plaster, they created frescoes depicting realistic people, powerful bulls, octopuses, and playful dolphins. These fresco scenes reflected the joy and contentment that characterized peaceful Minoan life. The scenes are full of energy and movement and usually painted with border designs. This fresco is thousands of years old. It was discovered in a room at the palace of Knossos. The walls of this palace were decorated with many brightly colored frescoes. 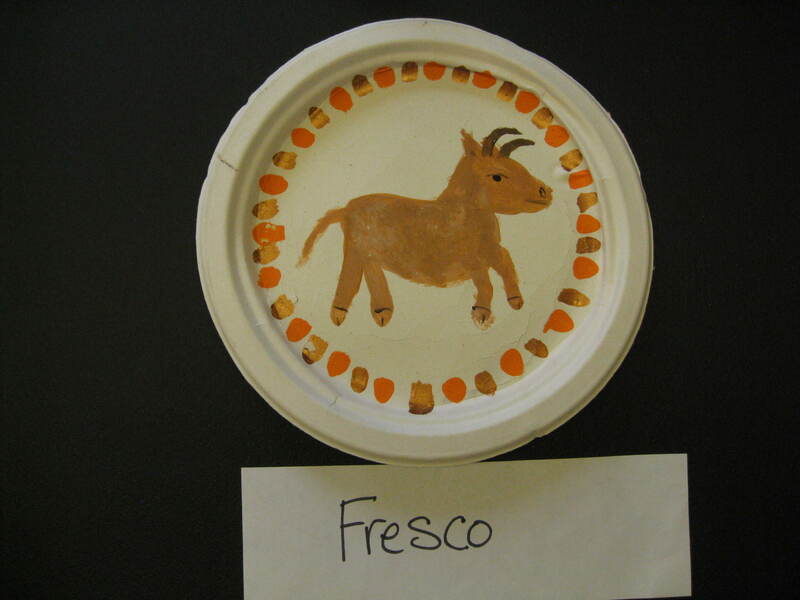 Fresco painting was an important form of Minoan art. Until the frescoes were discovered, no one knew what the Minoans looked like or how they lived. This is one of the best known of all the fresco paintings. What do you think the three people in this fresco painting are doing? They are probably young, professional athletes trained in the sport of bull leaping. Both male and female athletes participated and both dressed comfortably in high boots and loincloths. Men and women athletes both had long, dark, wavy hair. The women wore bracelets and the men were painted with broad shoulders. Minoans painted men a reddish-brown color and women pale yellow. Men and women were both depicted with long graceful arms and legs and tiny waists. 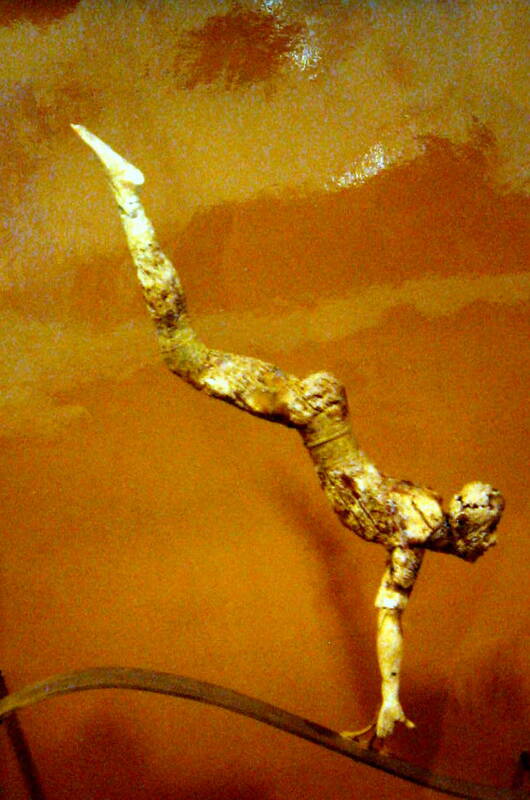 Minoans were always depicted as young, slender, beautiful and athletic. It is believed that at about the age of ten, Minoan children were bound with tight metal belts to ensure that they would retain small waists when they grew up. Each stage of bull leaping is illustrated in this fresco. First, the athlete grabs the horns of the bull. On the left of the painting, we see the jumper grab the horns of the bull without hesitating. Is this athlete male or female? How do you know? She is painted a pale yellow color and wears bracelets on her arms. Men would be painted reddish-brown, without bracelets. Next, a jumper would either jump onto the bull’s back, or leap over the bull, turn a somersault in the air, then land on his/her feet behind or beside the bull. This maneuver was difficult, dangerous and took great skill to be accomplished safely. The jump could become even more dangerous if the bull violently jerked his head up after the jumper grabbed its horns. This would cause the jumper to be thrust even further into the air. The athlete would need to quickly make adjustments for this extra momentum, in order to land gracefully and safely. Is this athlete a man or a woman? How do you know? Men are painted a reddish-brown color. The athlete on the far right illustrates the last step of bull leaping. What is this athlete doing? This athlete has just finished the leap and is landing, with arms still extended. Bull leaping, or bull jumping, is not the same as bullfighting, which many people are familiar with today. Bull jumping was much more dangerous and required more skill, strength and courage than bullfighting. Archaeologists believe that a bull was released into an arena, possibly a palace courtyard, and it would charge a jumper or several jumpers. Most historians believe that bull leaping was a very popular sporting event for ancient Minoans. 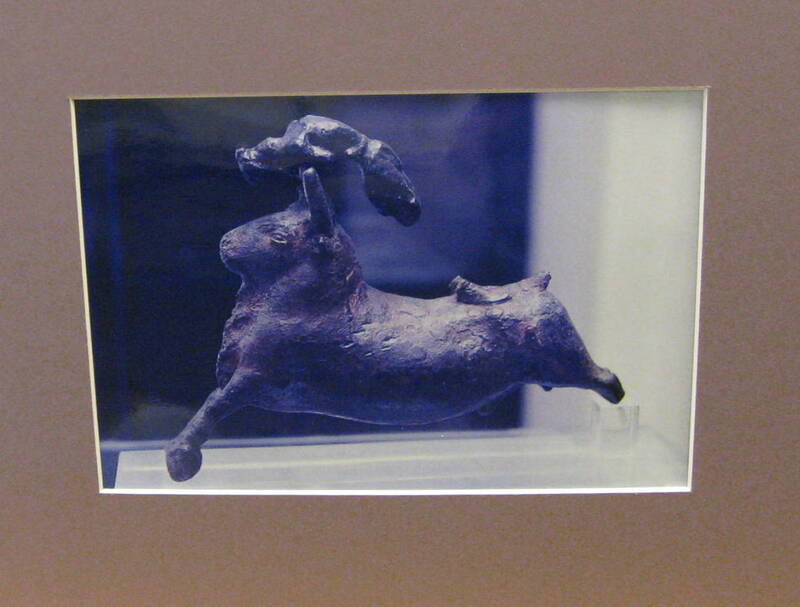 Archaeologists have found a great deal of Cretan artwork depicting bull jumping on cups, sculptures, and seals. Designs on Minoan seals show that sometimes the bull jumpers fell and were trampled by the bull. When archaeologists excavated several bull skulls on Crete, they discovered that the sharp tips of the horns had been sawn off. This was probably done as an attempt to make an extremely dangerous sport a little less risky. What type of mood is suggested in this painting? Thrilling excitement, a sense of danger and lighthearted fun. The bull isn’t portrayed as threatening because the athletes do not cower in fear. Scholars are not sure how to interpret this mysterious painting. While the bull is thought to have been sacred to the Minoans, this scene is not serious and somber. Most religious ceremonies are much more serious and formal. This scene is more like a thrilling, spellbinding, and entertaining circus act. That is why scholars are not exactly sure if bull leaping was a sport or a religious ceremony. Because this culture honored the bull in so much of their art, it is possible that bull leaping was more than just a sport. Since scholars have still not been able to decipher the Minoan script (writing) that has been found, we may never know for sure. Without access to this culture’s writing, much about these people remains a mystery. How did the artist create movement in this painting? Everything from each of the athletes’ arms to the bull’s tail is painted as though it is moving. 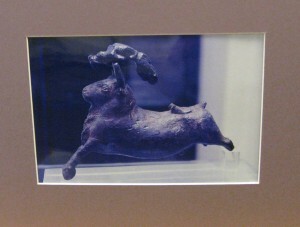 The athlete on the back of the bull has his legs extended in a somersault pose, as if he is about to fly off the back of the bull. All four feet of the charging bull are extended above the ground, as if he is moving extremely fast. The curving back and underside of the bull creates lines that also suggest movement. Can you find any repeated or alternating PATTERN in this painting? The repeated shapes and alternating colors of the border create PATTERN, as well as adding an additional sense of motion. Why do you think bull leaping was such a popular event? Contests that pit man against beast have been popular since ancient times in many cultures. There is always tension and spectators often sit on the edge of their seats watching dangerous sports. Being unsure of the outcome (whether or not an athlete will be injured) adds to the sense of excitement. Create a fresco painting. 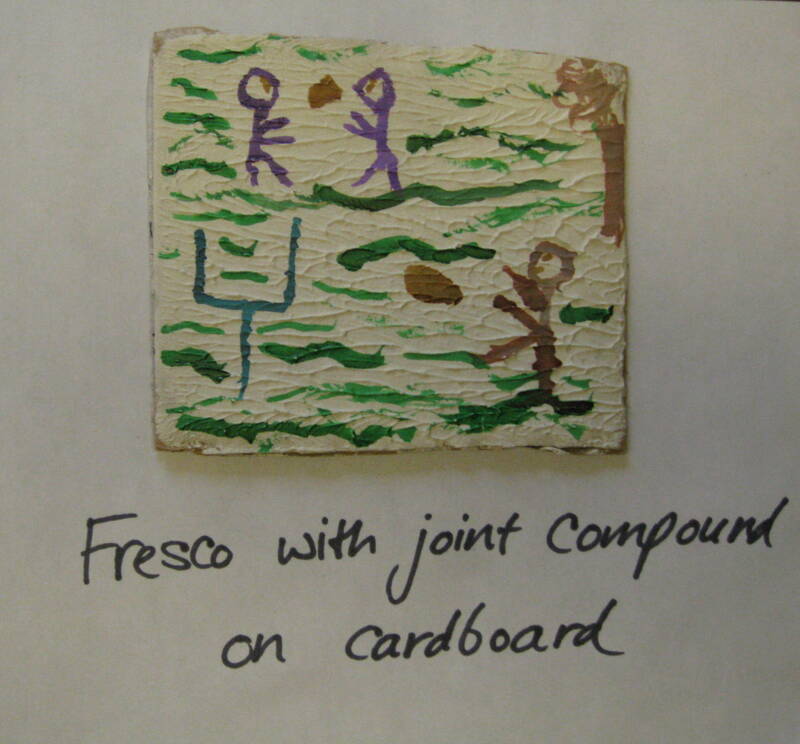 Use premixed joint compound and a paint roller to apply a thin layer of plaster to a piece of heavy cardboard, Masonite or Styrofoam. The mixture needs to sit at least an hour to be hard enough to paint on and it will completely harden in about four hours. To create True Fresco the plaster needs to be only a few hours dry. 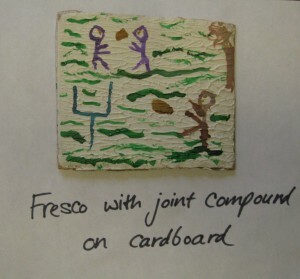 In this type of Fresco, watercolor paints will soak into the plaster, chemically changing to become a permanent part of the plaster, in much the same way the ancient pigments worked. Tempera, acrylic or poster paint will not work for this actual chemical change—only watercolor. Do not use much water with these paints, the brush should have more paint than water. Be sure to change water often so that colors will remain clear. When the plaster has been dry at least eight hours when painted, it is considered Dry Fresco. In Dry Fresco the paint sits on top of the plaster and is not as durable. These paintings will take several days to dry completely. Keep in a warm area, with good circulation, to avoid mold. Create an illustrated poster to advertise an upcoming Bull Leaping event. Discuss ways to illustrate motion and excitement, create more interest and draw the most spectators to the upcoming event. Create lists of action words that could be used in the advertisement. 4. “Ivory Figure of a Bull Leaper” from the Palace of Knossos, 16th Century BC. This carved ivory figure is a wonderful example of the realism that Minoan artists were capable of creating. The acrobat is caught in the very moment he is vaulting the bull and about to perform the astounding somersault, which will land him on his feet again, on the other end of the bull. Unfortunately, the bull sculpture that should have been paired with this athlete was never found. Ivory carving was one of the great arts of the Cretan palaces, but the evidence of this is scarce. Ivory begins to decay when buried in damp earth for any length of time, so examples of Minoan carved ivory are badly decayed and damaged. This sculpture has missing pieces and the surface has decayed enough to leave an extremely rough texture. Yet, it is easy to tell that a very talented artist created this realistic carving. The musculature of the human form seems very realistic in this sculpture. The hair of the athlete was originally created separately, from bronze threads attached to the carved ivory head, and it is now missing. The ivory for this carving came from the tusks of the now extinct Syrian elephant, which existed until the ninth century BC. The acrobat was carved in a palace workshop. Bits of ivory chips and even entire tusks of Syrian elephants have identified many ivory carving workshops in ancient palace ruins. Ivory was an important trade item Minoans imported from the mainland. What type of hairstyle would the artist have created for this athlete? The same as the athletes in the scene of the Bull Leaping fresco—long, dark and wavy (both male and female). The hair would have been windswept, behind and above the diving athlete, to create a sense of motion. What else did the artist do to create MOVEMENT in this sculpture? The artist has captured the feeling of an athlete as if in a freeze frame. The diagonal line and curves of his body create a feeling of movement. The arms and legs are longer than natural. This small exaggeration also enhances the sense of movement in the sculpture. This stretched pose is very recognizable today because most people have probably watched a gymnast or high diver perform on television or in real life. Although this sculpture has some damage, (broken leg, broken fingers, missing hair, and decayed surface) the athlete is still very realistic and recognizable. Look at your arm, wrist, and the top of your hand. Can you see any places where your veins raise the skin and create a raised line? (Help kids notice where their veins create raised lines under their skin.) If you look closely, near the athlete’s wrist and the top of his hand, you can still see the athlete’s own very realistic and finely carved veins. (Grades 4-5) Use clay to sculpt a three-dimensional athlete in motion. Try sculpting a runner, a golfer swinging a club, a baseball player swinging a bat, a pitcher throwing a ball, a football player catching the football with his fingertips, a tennis player swinging a racket. How about yourself hitting a tetherball on the playground or turning a cartwheel? Kicking a soccer ball? Throwing a basketball? These are just a few ideas for inspiration. (Grades 3-5) Create a two-dimensional athlete in motion using cut paper. Choose a moment to freeze frame and draw a stick figure posed in an action position on the background. Cut the body, face, arms and legs separately and glue them on top of this stick figure outline. Use other paper scraps to create the additional sports equipment and clothing. 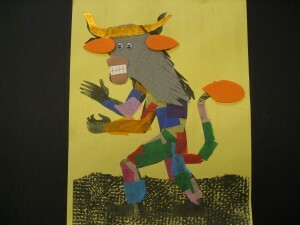 (Grades 3-5) Create an ABSTRACT two-dimensional athlete in motion, using paper cut in only GEOMETRIC SHAPES. An oval or circle could represent a head, a rectangle for the trunk of the body, and two joined ovals for arms or legs. Try triangles for hands and/or feet. A stack of triangles could also form the trunk of the body. A head could also be created from a triangle or octagon. Arrange the geometric shapes to resemble athletic and artistic MOVEMENT. 5. “Carved Bull’s Head Rhyton.” Circa 16th Century BC. Approximately 10 ¼” tall. King Minos was also called the Bull King. 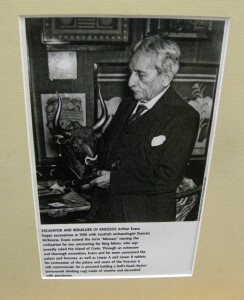 Legend said that he had a bull ancestor and was part bull himself. The people of Crete thought bulls had magical powers. Because of frequent earthquakes on Crete, Minoans developed an explanation for the cause of the shaking and rumbling. They believed an angry bull lived beneath the earth and caused the earthquakes. In Greek legend, it was believed that King Minos kept a Minotaur, a dangerous half man and half bull creature, in a labyrinth (or maze) under his palace. In a time long before scientific study of earthquakes, a powerful and angry bull seems like a logical explanation for unusual and sometimes frightening ground movement, doesn’t it? Can anyone think of a different, more creative explanation for the cause of earthquakes? Encourage one or two students to make up their own creative explanations. A Rhyton is an ancient Greek container for holding and pouring liquid, shaped in the form of an animal. This carved Rhyton was used in Minoan rituals. A tight fitting lid is carved behind the bull’s neck, where liquid was dispensed into the filling hole, then poured out the spout between the bull’s lips. The sculptured head is carved from a block of black steatite (soapstone). The carved details include long, shaggy engraved hairs on the animal’s neck, forehead, brows and cheeks. The eyes were created on a clear inlaid rock crystal lens, painted on the underside with red for the pupil, a black iris, and white. The painted crystal is set in red stone, to give a frightening bloodshot effect. The muzzle is inlaid with white, mother of pearl shell. The horns, which have been restored, were made of wood plated with gold sheets. This realistic container is an outstanding example of the skill of the ancient Minoan lapidaries, who were skilled experts in the art of cutting, carving and engraving precious stones and gems. It was found in the palace at Knossos, in a small room where rituals were performed. How did the artist create TEXTURE? Lines carved on the face, forehead and neck give the impression of the natural shaggy TEXTURE of an actual bull’s hide. Do these carved lines create IMPLIED TEXTURE or ACTUAL TEXTURE? If we could touch this carving, we would actually feel the 3-Dimensional lines, which is ACTUAL TEXTURE. Paintings with flat, 2-Dimensional lines create IMPLIED TEXTURE. What is an artist skilled in cutting, carving and engraving precious stones and gems called? (See second paragraph under About the Art) The type of artist who created this bull’s head was a Lapidary. 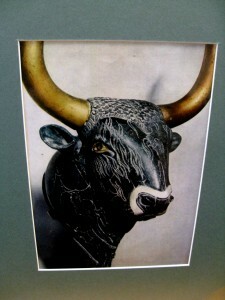 (All grades) Use clay to sculpt a bull’s head, or a charging wild bull. Draw a bull’s head similar to this one, on black construction paper. Use white crayon to create texture lines and other details. Cut and glue white construction paper shape for the mother of pearl muzzle. Use red for the pupil and to outline the white of the bull’s eye. To cut symmetrical (both the same) eye shapes, fold paper in half before cutting. Metallic gold acrylic paint will make the bull’s horns much more dramatic. Cut out and mount finished head on a light colored background. 6. “Pair of Gold Cups” Each approximately 3 3/8” tall. Late 16th or early 15th Century BC. This pair of cups is shown much larger than their actual size, to make it easier to see the sculptured relief decoration. 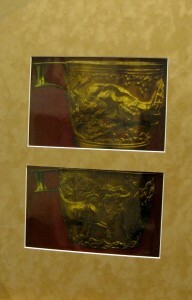 The gold metal of the cups was hammered and pushed to create a raised Repoussé decoration. Almost every ancient culture created some type of artistic repoussé decoration on some of their metal work and the Minoans were no exception. Archaeologists are now able to recognize the style differences between Minoan products and those created by Greek artists on the mainland. 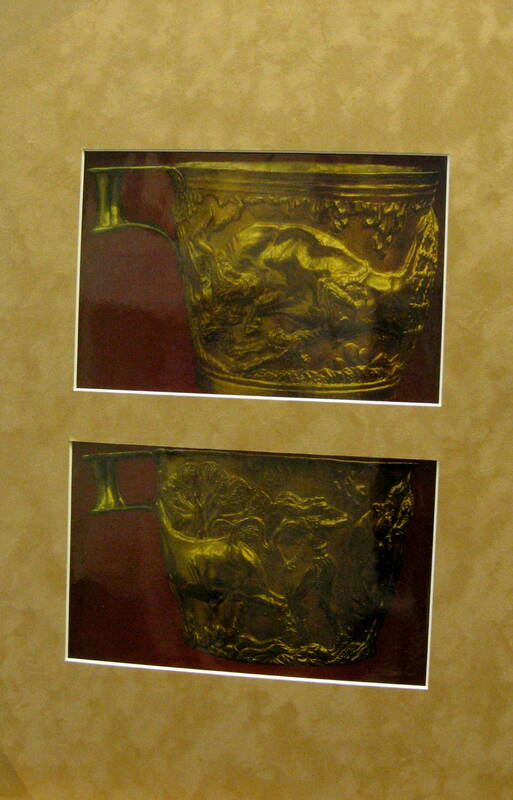 These gold cups were discovered in a tomb on the Greek mainland. Because of the styling, modern scientists can recognize that the two cups were originally created in Crete and imported to Greece for trade. The two cups were paired together as a set. The handles of the cups have been riveted on. One cup shows men attempting to capture an angry wild bull and the other shows peaceful, tame cattle being roped. What type of scene decorates the top cup? A wild bull’s capture. A charging bull has been caught in a snare (depicted by the crosshatched ropes on the far right edge of the cup). How did the artist create the feeling of movement? To the left, one daring man has grabbed the bull by its horns and is swinging one knee over the left horn (seen above), in an attempt to land on the back of the bull’s head. Curving and diagonal lines help create a feeling of movement. The bull and the two men are depicted in precarious, unbalanced poses; all three are suspended in the air. It is as if the action is suddenly frozen. We can figure out what happened just before this moment and it is not hard to guess what will happen next. Can you see the bull’s horn between the man’s two raised legs? Can you see the man’s head just above the ground? Point out the way the long hair of the man flows to the right, away from his head. What else is going on in the scene? A second man has been thrown off the back of the bull and is dropping, head first, towards the ground, with his face up and his hands outstretched. This man’s flailing legs are higher than his head and the tip of his left foot can be seen along the bull’s spine. The bull’s two front legs are lifted high off the ground and the man’s arm is about to be trampled on. What can you see in the scene decorating the bottom cup? A Minoan young man stands between two cattle. We can tell he is Minoan because of his small waist, long curling hair and strong muscles. He resembles the athletes seen in the Bull Leaping Fresco. The man holds a rope in his hands, attached to the lower leg of the animal that seems undisturbed by this action of capture. In the background, behind the captured bull, stands a tree. The top and bottom of this cup are decorated in a similar way to the other cup. Draw or paint a picture of a cowboy roping cattle. Use techniques that create the effect of MOVEMENT (review discussion above)! Find an action photograph of a cowboy roping cattle on the Internet and project it on the screen for the class as they work on their drawings. (Teacher can help.) Another visual aid could be a painting of cowboys roping cattle. Check Internet images of Charles Russell or Frederick Remington to find a roping cowboy painting. The Minoans were a seafaring people. Their island in the Aegean Sea made it possible for them to have many ports from which they could sail to mainland Greece, other Aegean islands, and even Egypt. This made it possible for the Minoans to become very successful merchants, trading food and other items with people living on other Aegean islands, and those living on the continent. They became rich and powerful. 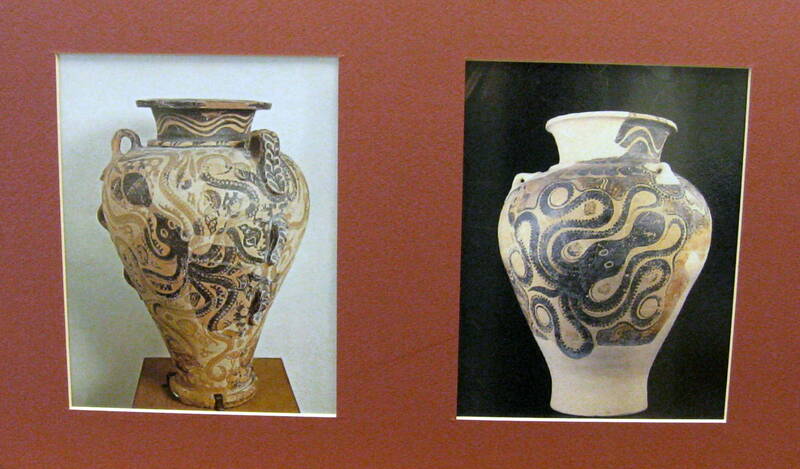 Minoans exported oil, olives, wine, jewelry, and crafts, such as beautifully decorated pottery. 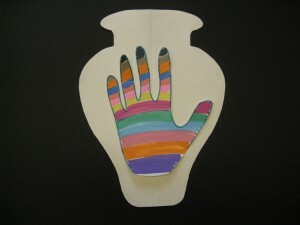 Why might the potter have chosen a design like this to decorate the pottery pieces? Be sure the class understands that Crete is an island off the southern coast of Greece. Octopus, various fish, seaweed, starfish, seashells, seahorse, crab, etc. would have been very common and familiar objects to these island people, and probably a popular decoration for pottery traded to the mainland. What kind of LINE do you see in this design? Curving or Curvilinear—the tentacles of the octopus spiral and coil and turn on themselves. The vase paintings are good examples of the Minoan feeling for dynamic MOVEMENT in their art. The curling lines create a sense of moving octopus tentacles. Point out the way the artists have also carefully arranged the tentacles to fill the entire space of the vases with the picture of the octopus. This was no accident; the artists carefully planned to make this happen. Use clay to create small coiled pottery. Use toothpicks to carve some type of sea life design into the pot. 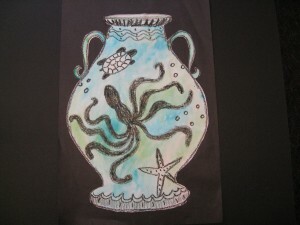 Bring in seashells and books with pictures of shells for class inspiration. Roll clay out flat on a sheet of waxed paper. 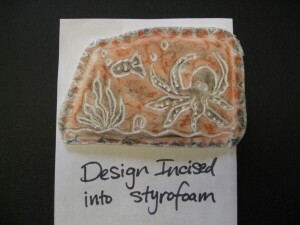 Carve a plaque with a sea life design, using a toothpick. Use a straw to cut a hole at the top for hanging. 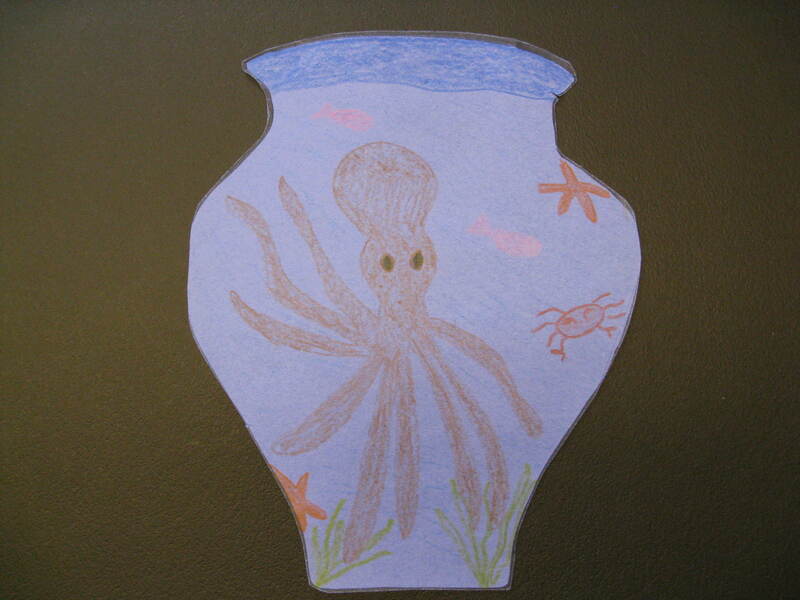 Sculpt a clay octopus or starfish. Bring in several photographs for examples to copy. Bring an assortment of shells into the class for the kids to examine. Sculpt a clay shell like one of the models. 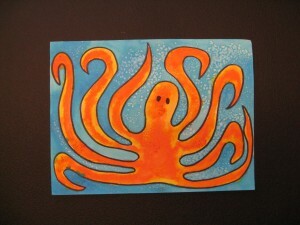 (K-2) Create an undersea picture that includes many types of sea life, using cut paper and/or paint, on a paper plate. Add seaweed, sea urchins, starfish or sharks. What about a whale, octopus or mermaid? Sprinkle a bit of loose glitter on the scene, then tape a piece of plastic wrap across the plate, to hold the glitter inside. Static electricity will cause the glitter to stick to the plastic wrap when shaken and give the illusion of a sparkling undersea scene. Create a three-dimensional underwater diorama with a shoebox, cut paper and paint. Cut out fish and hang on thread or clear fishing line to give the appearance they are swimming across the created scene. Create seaweed and glue to the base, along with a few rocks, a possible sunken ship, treasure chest or anchor. Be sure to include other fish or sea life on the back panel (box bottom) of your diorama. 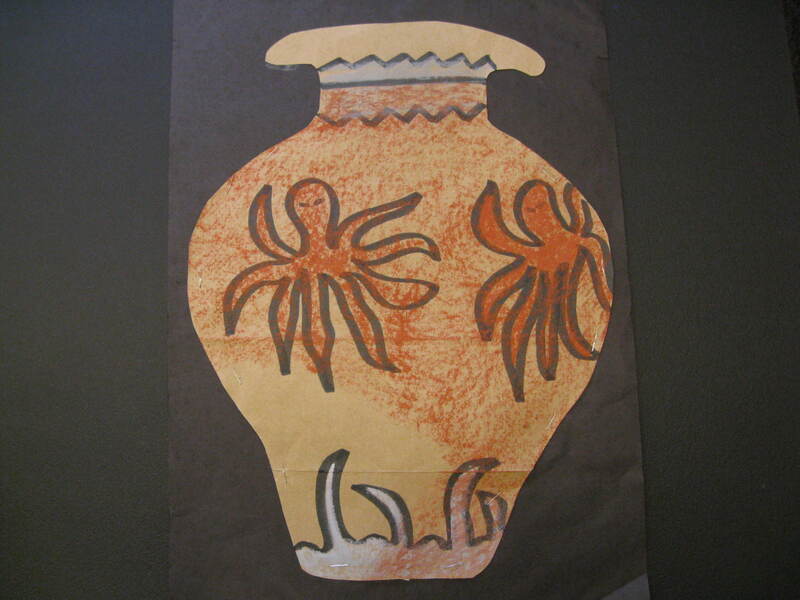 Explore the shapes of ancient Greek or Roman vases and pottery in books, on the Internet and in encyclopedias. Have the class choose their own pottery shape to draw on white paper. Fill most of the page with this shape. Design, paint, and color creative decorations inside the shape. Cut out the pottery and mount on a black background. How, after centuries of damage and destruction by the weather and earthquakes, can anyone tell anything about the houses of the ordinary citizens of a vanished civilization? Sometimes archaeologists are forced to make educated guesses based on what they know about the climate and the available building materials. Solving this mystery was made a little easier for archaeologist Arthur Evans when an ancient wooden storage chest, fitted with clay panels, was found at Knossos. 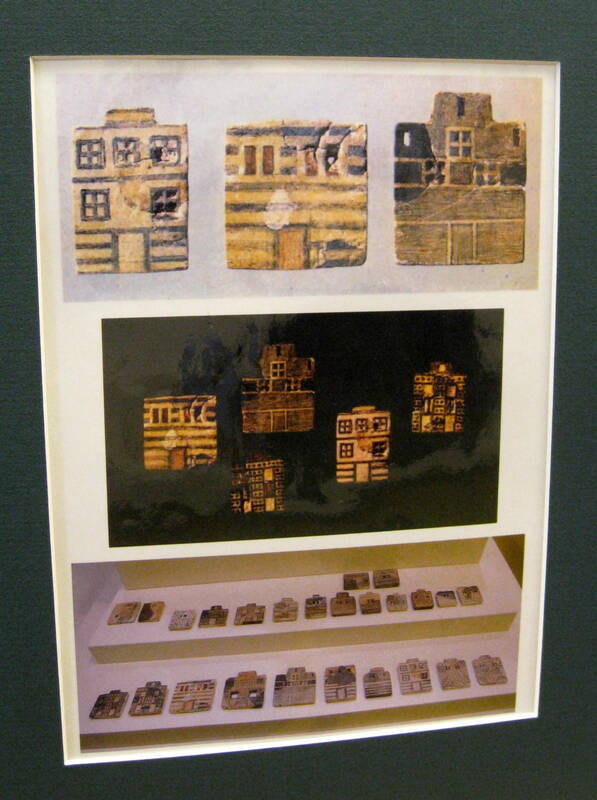 Although little is known of everyday Minoan life, these miniature clay plaques show what are believed to be ordinary Minoan homes. By studying these clay pictures, scholars have been able to piece together an idea of how everyday Minoan homes probably looked. It seems that Minoan homes were tall, flat roofed, box like buildings, constructed of stone, clay bricks, plaster and timber. They were two to four stories high and had six to twelve rooms arranged around an open courtyard. Openings in the walls for doors and windows were either square or rectangle. Often the outside walls were decorated with colorful patterns, especially horizontal stripes. The first floors appear to have been built without windows. How were these Minoan homes similar to buildings today? How are they different? What type of BALANCE do these clay house plaques have? Are they SYMMETRICAL or ASYMMETRICAL? Symmetrical because they are the same on each side if you divide them in half with an imaginary line. Do you see any ORGANIC SHAPES? No, organic shapes are natural shapes, such as leaves, twigs, rocks, clouds, flowers, etc. Can you find any PATTERNS on these plaques? Allow kids to point out the variety of horizontal line patterns found. There is also pattern in the placement of the windows and in the windows themselves. 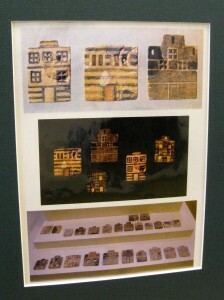 Use clay to create your own version of a Minoan House plaque based on these examples. Use bright colored paper cut into various widths of strips to decorate a square or rectangular paper house plaque. Cut rectangles or squares for windows. Decorate the doors or windows with colorful trim created from colorful cut strips. Glue these colored house plaques to a background and decorate with landscaping of your choice. Design and draw a Fresco border along the upper outside edge of the building if you would like. 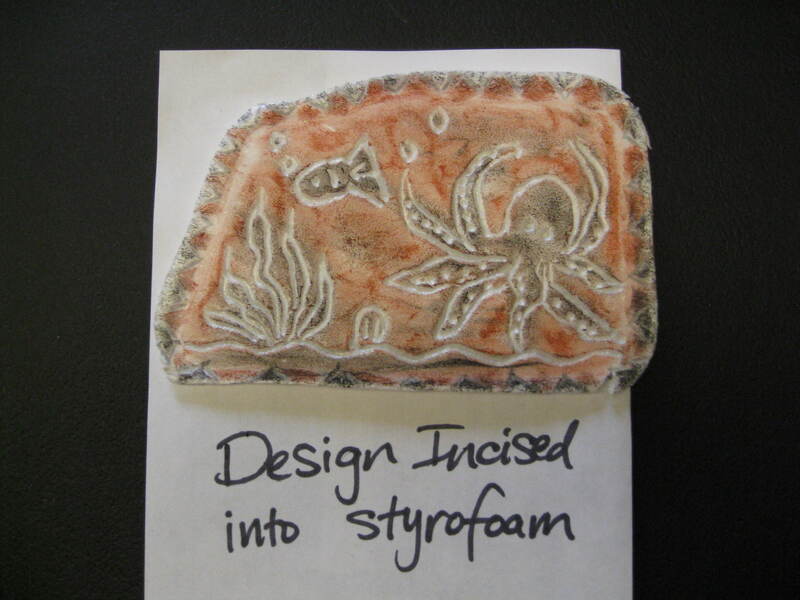 Create a three-dimensional model of a Minoan house or palace. For the walls use cardboard or shoeboxes. For the door and window frames use Popsicle sticks or cardboard strips. Paint with tempera paint. Consider stacking more than one box to create a house that is several stories high. Use your imagination and create dioramas inside the house to show what the interior may have looked like. Use your imagination, because nobody really knows what the interior of regular Minoan’s homes actually looked like! The queen’s area of the Palace at Knossos had beautiful walls depicting leaping dolphins. 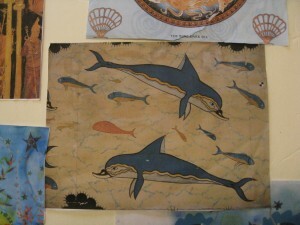 Maybe you could paint a bordered design with dolphins for an interior wall. 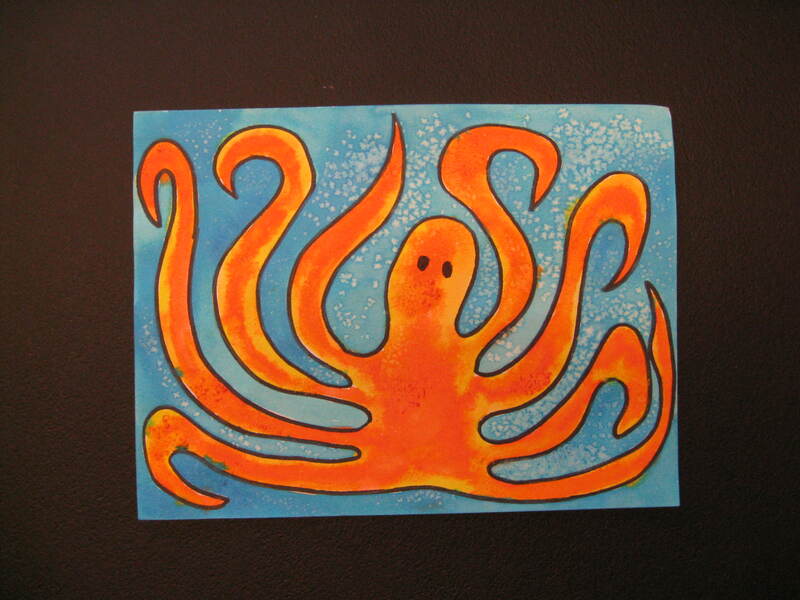 Maybe you would like to paint a wall with organic shapes—other types of sea creatures. You might paint a design using freeform (abstract) or geometric shapes.